The National Festival of the “La Pollera” was officially instituted by means of the Executive Decree of July 22nd, 1957 and through the Law # 50 of November 24th, 1961. The National Festival of “La Pollera” is carried out July 22nd of each year, inside the framework of the local Holidays of Saint Librada in the City of Las Tablas in the "day of the middle" or known as "The Serene Day". This festival is organized for the “Club de Leones” of Las Tablas [benefit institution] and the Committee of the local holidays of Saint Librada. Each year they choose a queen and her princesses, which have to be “tableña” [from Las Tablas] or of tableñas roots. El main event carried out in this festival is the Contest of the “Polleras Margarita Lozano", in which “polleras” of all the country participate and the one that is selected as the winner grants the medal of gold "Margarita Lozano", which is the highest distinction in this festival. Nevertheless, other contests in the festival are carried out, such as: National contest of Violins "Clímaco Batista", the National Contest of the “Camisilla” [National Custom of Man] and the National Hat. This last is divided into two categories: Hat of Luxury (White or Painted) and Hat of Reed (hat used to work). Besides, there are other folkloric exhibitions very important. The queen wearing a traditional Polleras while dancing during Carnival. 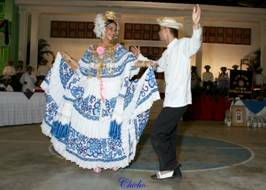 The Azuero Peninsula embraces its heritage and culture. Panama is a unique real estate opportunity because rarely does a place provide such natural beauty with breathtaking ocean front and ocean view real estate. Don’t miss out on the investment that is taking place all over Panama and with the beach front property on the Azuero Peninsula.